Is it the word or something?! Sign: Behaviour change? Is it the word or something?! Thanks, the neighbours. Say, you are Eugene. You had too much to drink. You stumble out of the pub still holding your drink. On your way home, through the alley, up the stairs. Should you, while zigzagging, happen to look up and have your night vision goggles on you, would this sign stop you from dropping your glass? Or would you cleverly follow the throwing instructions? This campaign wanted to reduce the littered rubbish. Effect? More rubbish (according to traffic engineering platform verkeerskunde.nl (in Dutch)). Why? It is literally advertising rubbish. It shows ‘Littering is what people do here’. So how can you use the power of the descriptive norm in a positive way? I challenge you to think about how you could use it where you are or where you work. A very good example is OPOWER, an American power company whose utility bills also state how your usage compares to people around you. And you get a smiley face if your usage is below average. Result: 40% reduction in energy use. ‘The equivalent to removing 150,000 homes’, Griskevicius, Cantú, & Van Vugt (2012) report. 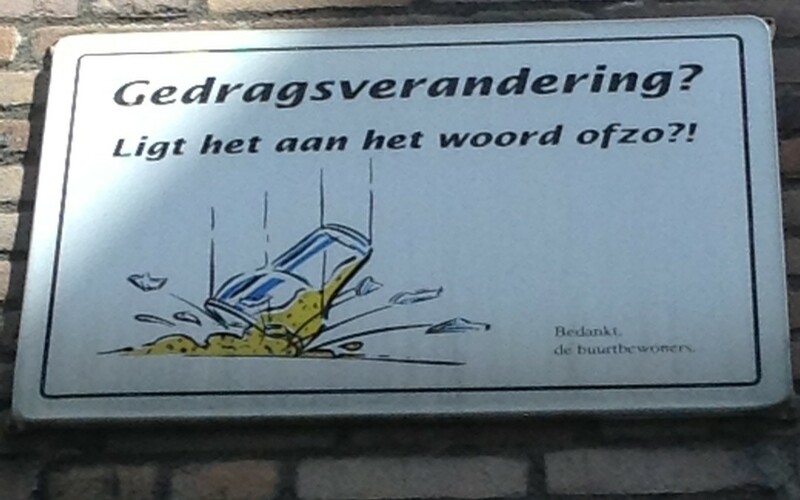 I found the sign our imaginary drunk Eugene could have encountered in an alleyway in downtown Rotterdam. Poor alleyway dwellers. Certainly not psychologists. It absolutely is the word. The wrong word and certainly the wrong picture.